Report from the Lake Mountain Sprint X (courtesy of Lake Mountain website). In launching Australia’s 2014 cross country ski race calendar, Lake Mountain’s Sprint X event attracted some of the nation’s best on Saturday, June 28. The field included Australian sprint champions and Sochi Olympians, Esther Bottomley and Phil Bellingham, members of the national team and Tom Smith, a US development coach working with the Australian squad and a top level skier in his own right. Phillip took out the Open Mens while Esther topped the Open Womens. Race organiser and Director of Operations at Lake Mountain, Andrew Paul, said it was great to see such a high caliber of skiers at the Sprint X despite the challenging weather conditions. “The event is very competitive, but there is a real fun element with competitors dressing in their favourite onesies ranging from fluffy kangaroos to 80s fluro lycra. There are also spot prizes such as ‘best stack’,” he added. Once again Skike Australia have generously offered to sponsor the Victorian Ski Chase, with a pair of v07 PLUS Skikes to be won by random draw at the end of the season. And once again we have cash prizes for competitors 25 and under up for grabs. The first event (Birkie Classic) is less than three weeks away, so click here SkiChase2014Poster for details on how to register and check out the dates of all the events so that you can start planning your winter ski activities. With a bit of luck we’ll be skiing by this time next week. The Ski & Snowboard Australia Cross Country Committee (SAXC) welcomed some fresh, new talent into its line up at the recent Autumn meeting in Mt Beauty, with Ashleigh Spittle and Paul Kovacs joining SAXC as Athlete Representatives. The Athlete Representative appointments now completes the expertise-based SAXC committee, which was formed in late 2013 following an extensive internal review. 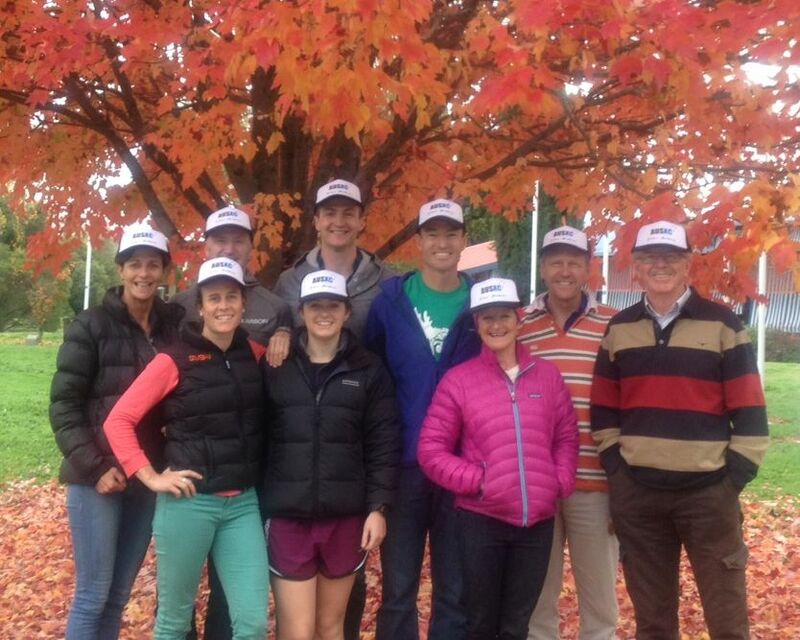 SAXC Committee inspired by the Autumn splendour of Mt Beauty: Back L-R: Michelle Armstrong; Finn Marsland; Paul Kovacs; Ben Derrick; Peter Cunningham; Front L-R: Allison McArdle; Ashleigh Spittle; Ronice Goebel; Peter Ward (NSWXC Chair, invited guest). SAXC Committee members absent: Toni Hulme; Anthony Evans; Chris Darlington, Andrew Walker. The World Championship Team will likely consist of 7-10 athletes. The World Junior / U23 Championship Team will likely consist of 4-6 athletes aged 16-19 (junior) and 20-22 (U23). The WUWG Team will potentially contain 4-8 athletes. Details of the International Development Tour are still being finalised, this will likely involve athletes training and competing from a European base. Please note that some coaching/management positions may be combined and that multiple persons may be appointed to some events. Additional information is provided in the job descriptions in the linked PDF below. Interested persons should apply via email to SSA Cross Country Skiing High Performance Manager Finn Marsland (finn.marsland@gmail.com) by Friday June 20, 2014, briefly addressing the key selection criteria. Applicants may be invited to supply additional information and/or to attend an interview. The appointment will be made by a panel appointed by SAXC.